Discussion in 'Maker Casual' started by BerryB, May 26, 2018. I won't do this on a regular daily basis. Just playing the ones that I find interesting in my own time. So don't expect regular weekly videos. You think I'm joking? Well, I have made a couple of videos as examples, just in case. I guess you can see it for yourself if you want to get an idea on what I'm making. I will showcase the first boss guide of the game here. Everything else, you may refer to in the playlists that I've organized for each game. Now, let's get down to business. I will lay down some ground rules for you so that you guys can have me play your game while at the same time making you some fancy thumbnail artwork. And I will make this as clear as possible so you guys can understand. I don't want any of you to send me games and ended up hurting your feelings if I ended up somewhat disliking it to some extent. That's the last thing I wanted. It might happen, but I do at least want to mitigate it the best I can. P.S: RPG Maker games only. 2003 and XP is not recommended as I might have issues recording with that. 2. I will likely not do full playthroughs. Only boss fights. So if your boss fights are uninteresting to me or if there aren't any, then it's an off deal. I won't continue playing (or play it in my off time) or making any boss fights of it. 4. If you send me your game, you are liable to get my honest opinion on it. However, I will try to make it as fair as possible. I don't necessarily like to be negative, trust me on this. Besides, I have been getting criticized as well. I understand how painful it is to get negative feedback and all that stuff. So if you feel like you're not ready. Don't send it. 5. In terms on whether or not I will make a guide. My standards are as follows. If you have a score of 8.0 or higher, there is a high chance (not guaranteed) I will make boss guides for your game. As for how the scoring follows, you may refer to this document here for more details on many of the scores I have accumulated over in the many RPG Maker games I've played/watched. Exceptions will be made on a case to case basis. 6. I won't give any feedback on mapping and story wise in detail. Simply because other let's players can do a better job criticizing and giving feedback to mapping and writing. (And to be fair, I am weak at mapping, so I don't exactly have the right to judge.) I prioritize battles more than anything. So if you want feedback on what I think of your game's experience overall like a normal let's play would, this isn't the guide for you. 7. I am liable to make any mistakes because my opinions aren't necessarily correct or valid. If you wish to make any justifications and corrections, feel free. I will try my best to accept what assessment or mistake I made and will attempt to change it as long as your reasoning is sound. That is all. If you wish to ask for more questions or request a game you wish for me to make a guide on. Either send me a PM or send a comment. I'll be happy to accept your game/answer your questions as long as I have the time. But keep in mind that I will at least play it and assess it myself before making any final conclusions on whether I will make a boss guide for it. I will PM you the results if you choose to send me your game. Starmage, Fernyfer775 and atoms like this. @BerryB Question: You didn't mention it, but are you okay with demos? My main game is still in production, but I do have a demo ready in the mean time. Asking since you didn't say "no demos" or anything of the sort. @JtheDuelist If you have seen the videos above, you'll see that all of them are demos. So yes. You can submit demos. Recent Updates of Rave Heart 5.0, featuring the new bosses and an optional boss that is labeled as EX1. Hello, do any of these games of mine seem to interest you? Releasing the last bit of For the Treasure's boss fights as of v. 2.3. This game gets my recommendation. I approve of this game and encourage you to try it out for yourself whether or not your feelings reciprocate mine's when playing this game. Now. Unlike the other games I've played so far, this game actually diverges specific things if you select a different difficulty. And it doesn't exactly give you the difficulty in the traditional sense. Your choices actually affects your difficulty. Normal is already a nightmare as it is and Hard is.. oh boy... Hahaha.... Although to be fair, I was only playing the prologue and it drained me a lot after playing it for like.. 3-4 hours? So with that in mind, it will take some time for me to prepare this boss guide as I kinda need to mentally prepare myself for exhaustion. Although I also am not sure where to begin since there are a lot of diverging pathways and some bosses take less than 2-3 minutes to finish, which honestly isn't bad.. but I do prefer not stopping at just like 2-3 minutes and call it a day (Of course, I might be wrong about this and it was just my silly speculation that the first boss ended way too quickly). And don't even get me started on the "optional" boss of the game. (I spent nearly 30 minutes or more trying to beat the "sidequest" event and that's on Normal) That one is a nightmare all on its own for me which actually forces me to use items (I know, shocking, right?). But we'll get to more details on that when I actually make the boss guide for it. Also, Tuomo, I've seen your games in the general sense. Sorry, but Adventure of Dragon is the only game I kinda remotely seem interested in (but I don't have any intentions of getting it right now). And the other two I have no interest in playing. So I can't/won't make a guide for any of your games as of now. But thanks for the offer and suggestion though. Good luck on your RPG Maker endeavors. I do have a question; do you mind if I add the art you made to the folder in the future under 'Fan' art? Ofcourse you will receive a special thanks in the art section in the credits if so. If you rather not I can totally understand, no problem! I just wanted to say I love your fan art for all these projects, must also make the developers quite happy. Oh, I would give the game key to you for free of course. So. I was about to record the Lost to get to the boss so I can make a guide off of it. But for some reason, the game doesn't seem to work on Window Capture. 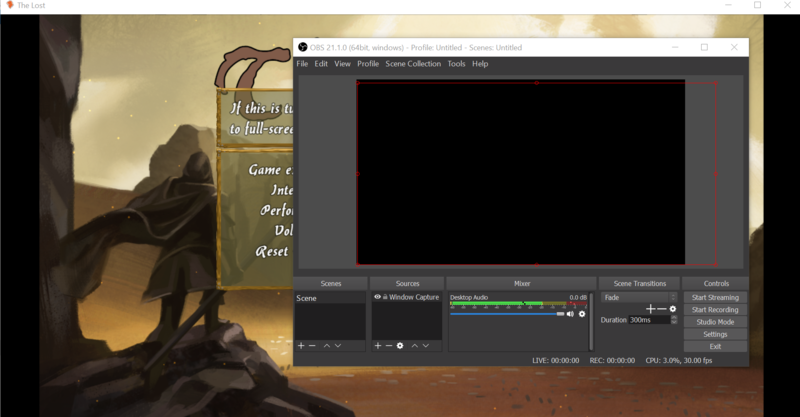 It works on Desktop Capture for OBS, but it makes it far less convenient for me since I have to directly slap the desktop capture and edit it so that it would fit the screen, which is more work than what I can afford to. 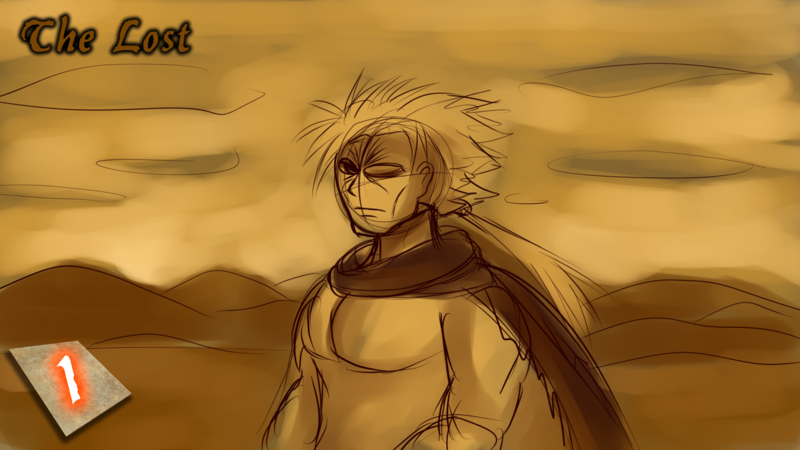 Because of that, the Lost will be on hiatus for a little bit and I will find a way to resolve this somehow. Because while it doesn't work in the computer I was recording, it works on a different one. So I might be able to record it if I resolve the other issue my other computer have (which is constant freezing and a lot of audio/gameplay lags). *Anything past the first boss will be adding a spoiler tag on it to prevent spoilers. @Dutch Power Creations You can add me however you like. Thank you for that. @atoms I really appreciate you coming here to give the gesture. And thank you for loving it. I try my best to capture the essence of the games being played, even though I still got a ways to go. @Tuomo L You may want to clarify the details on that via DM (direct messaging). I will still assess it on a case by case basis. But I may not make a guide for it. Fernyfer775 and atoms like this. I think it's great and gives a nice presentation look to your boss let's play too, and it must take a bit of time to do too so it's nice to see someone put in that work for each game's presentation and their LP's of it. @BerryB Hope it works out for you. I have all the time till you find a set up that can play it right. Just check up on a possible new version of the game when you have it up and running for the latest improvements. Good luck till then! You have no idea how absolutely giddy and excited I was to find out that you did a full-clear on hard mode of my game! A friend of mine just linked your videos to me, and I am absolutely ecstatic about watching each and every one of them to see how you did against my beautiful creations. I have to say, kudos for beating the game on hard mode. A lot...and I mean A LOT of people struggle with playing the game through Easy and Normal, but you've shown that it is very much beatable, even in the hardest difficulty. I also have to add, that I am so in love with the boss art you drew! I have the entire guide made for Eternal Twilight now. Everything's been published. Unlisted isn't doing the job for some reason so I ended up having to public them all. The Lost, I'm still struggling to get the video out. Maybe it's because it's always set to Fullscreen or my computer just can't do it for me to record your game. Sorry, but it's gonna take a lot longer. In the meantime, this game is getting the next guide treatment. Made by Unity for the Winterruption 2017 event. @Fernyfer775 I'm humbled to hear that. Honestly though, I grinded way more than the average joe. Let me throw a couple of cents into your disdain for people's complaints since I also saw them talking about it through the forums. So you should expect that people aren't really aware of gear tiers + crafting > levelling since people didn't really seem to be aware of it and they prefer to play the game for the story than the balancing of the boss battles (which is not a bad thing to emphasize on with your game, but can be a detriment to others who aren't RPG maniacs or fanatics). Not to say that this is a detriment, but if you want people to stop complaining about the difficulty, you need to actually emphasize the gear and materials to be the crucial key to victory. In addition, people need to also be informed about the status menu by pressing X at the start of every turn more often since I certainly didn't check it until the 6th or 7th boss. Also, people aren't smart enough to know Medi Guard actually increases your defense and your shield by a certain amount. I certainly didn't know until the late game. I'm not sure if this is helpful or not, it is a mouthful. But considering that people have said good things about your game, I have high hopes that you'll improve and hopefully mitigate people's complaints to a minimal degree on future installments. Thanks for the wild ride. Guess I will look into it before the next update if you think it is because of the full screen. I will PM you through discord with a link when I put a new version out so you can check if that was the problen. Really excited after seeing some of the videos of Ferny's game and gj beating it! So, I have just about wrapped up recording nearly all the necessary footage for Quest Questers, even beating the "superboss" of the game. Granted, it's with a KO, so I may need to do a little more luck and thought to get a no KO run on nightmare for that one. The rest is just thumbnail work, which will take some time. I will be doing it regularly, so all of Quest Questers should be finished by around... the end of September? I hope. I won't make any promises though. On the other side of the spectrum, I had to switch to another laptop for this, but I finally got the Lost to record, finally. This will be next, I believe. And as I said, there are diverging paths in this game that actually affects your difficulty. So I will be going around doing some legwork on my editing skills for the next couple of parts. I'm no master at it, but I do the best I can. That's all I can do. My future plans will involve... some ridiculously extensive editing. But if things went well, the first episode should be done this year. (I hope.) What kind of plans I have for this "first episode"? Well... I'm afraid I'm gonna have to keep a tight lid on that one. Ow how nice is this! Really looking forward to your video's. You already have given me some great feedback on phasing and I will definitly get the ATB level in before the demo of this game comes out. With the slow text you could hold space bar to speed it up or you could press Page Down to skip/instant appear. I will look at a plugin for the options menu so people can just let texts instant appear or let it play out at the phase I set. Thanks again and really looking forward to some of the bosses coming! You can check out my game, following all the points in your post (has RTP graphics though). Game is short with full focus on battles, no story or dialogue to slow you down. 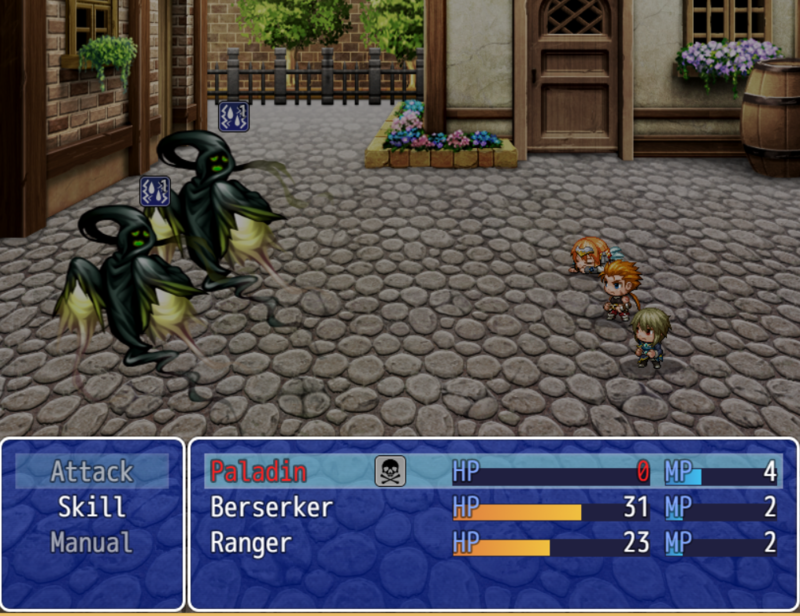 There are 4 different bosses, but you only get 1 random at the end of the game. Link to my game thread is in the image in my signature. @Milennin Um. I just played the game for a brief moment and found this strange conundrum here. I can't continue forward because I accidentally picked the paladin and I can't choose anything because she's gone. I will continue to replay it. However I'm afraid that rule #3 is in effect. "However, if you do use RTP, you have to wow me in terms of story and gameplay"
While the gameplay, from what I have seen so far, is fine tuned relatively well and makes for a more arcade-esque challenge, the fact that you removed story elements completely from your game makes me feel like I should win this over with your balancing and your battles, which isn't bad mind you. I will continue playing. But the chances that I will make a video on this game is about a 50/50% chance at best. Here's hoping that when I finished it, I can say that I will make a video for it or not because making a guide for this when there are randomized elements in your game is not exactly making me easy to go through every nook and cranny, at least so far from my first impressions. Regardless, it is an interesting entry and one where you poured a significant amount of effort into it. So thank you for letting me play your game. @Dutch Power Creations Phasing huh. And ATB Level huh... Also, maybe you could tell the player that you can skip using pagedown. I didn’t know until you tell me. So a short help guide saying that in-game would be helpful. Also, dude. You played my game and gave me your thoughts. (I can’t thank you enough for that.) I would be happy to look into your game this time around. Hopefully it will be helpful to you. If I do have something I missed, got incorrect or forgotten, feel free to point them out. I would like to hear more of your thoughts on your game as a dev making it and I’m not always right either.